Electronic Component Part Marking Experts with full array of exciting laser products! 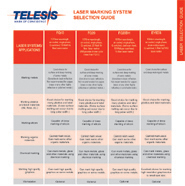 Telesis Laser Marking Systems provide traceability for a wide range of electronic components and appliances. We offer a variety of 532nm and 1064nm YVO4, Pulsed Fiber, and CO2 to suit your specific requirements. 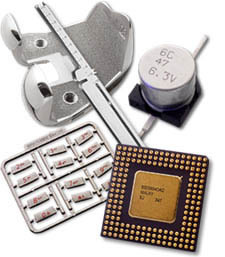 From circuit boards and keypads to delicate micro chips and capacitors, high-speed laser marking is the answer for many manufacturers. The specialty laser marking solution for your electronics parts is the Telesis EV4GDS Green Laser System. It is ideal for marking and processing difficult materials; colored plastics, acrylic and polymer materials and is perfectly positioned for use in the electronics, semiconductor packaging and highly reflective materials. The fiber-coupled, diode pumped, solid state (DPSS) green wavelength laser marking system features optimized laser beam and Q-switched pulse characteristics for applications that require high beam quality and stability. In addition, the Telesis EV4GDS Green Laser Marking System offers extra power and speed for precision marking, and is an excellent choice for laser marking, scribing, trimming and other material processing applications. In addition, our material handling experts have years of experience, so they can work with you to develop the most effective solutions to your most sophisticated electronics part-marking challenges. We can provide material handling systems for standard component, high-volume manufacturing lines-- as well as for batch marking, and lower-volume parts lines. Increase your productivity with a Standard or Custom-Engineered Telesis Laser System today !